2016 is the 30th anniversary of the release of the movie "Pretty in Pink", so let's go back to that era for a night of improv. Based on the classic John Hughes movies of the 1980s, like “Pretty in Pink”, “Some Kind of Wonderful”, “Sixteen Candles”, and the iconic “The Breakfast Club”, an Improvised '80s Teen Movie brings the genre to life on stage. 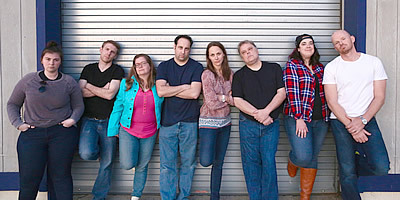 Improvisers will take audience suggestions to inspire the recreation of an '80s Teen Movie. Live improvisers spin a new tale of teenage angst, drama and romance each night, so if you like the first night, come back again, since the second show will be completely different. “It’s rare to see this kind of improv in Connecticut,” show director and producer Claire Zick said. “The actors will create a full-length 80s movie on stage, all made up on the spot from the audience’s suggestions.” Each show offers a unique experience for audience members as performers use their suggestions to create a new story in the style of an 80s John Hughes classic. Be prepared to see: cool kids, rich kids, misfits, jocks, rockers, and stoners navigate through the trials and tribulations of high school life. Dodging clueless parents, meddlesome teachers, and the rough waters of high school social hierarchy you'll feel like Molly Ringwald might appear at any moment. Presented by Hot Cocco Productions and Playhouse On Park.